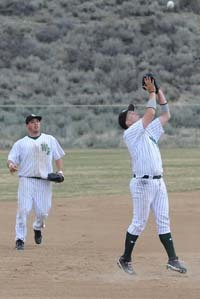 Wood River third baseman Nick Brunker snaps a pop fly while shortstop Ben Williams (left) checks out the play during Saturday’s home game won by Burley 7-2 at Founders Field in Hailey. Playing scrappy baseball and going to the seven-inning limit in both games of a doubleheader for the first time this spring, the Wood River High School baseball team made progress Saturday in Hailey. The visiting Burley Bobcats (5-10, 4-5 league) won both games of the Great Basin Conference twinbill by scores of 7-2 and 9-4. But, as Wood River coach Matt Nelson said, "Although the scores seem high the games were much closer and the boys were relentless." In the first game, for example, Wood River's rock-solid defense committed only one error, that a harmless throwing miscue that moved up a runner. The Wolverines played well in the infield led by shortstop Ben Williams, who turned a double play, while outfielders Austin Krenz and Jared Anderson made solid catches. Starting pitcher Finn Isaacson (0-5) went the distance, throwing 108 pitches in seven frames and scattering 10 hits. Except for one inning when Burley scored five times, Isaacson was in command—holding the Bobcats scoreless in four of the stanzas. He whiffed five. Unfortunately Isaacson was up against a tough customer in Burley righthander Joe Ferrin, who allowed only five hits and no earned runs with nine Ks. Issacson (double) and catcher Tim Boyle each had two hits. In Saturday's second game, starting pitcher Williams threw well in five-plus innings and Wood River kept the game close—trailing only 6-4 after six complete. Burley scored three insurance runs in the seventh and escaped with a 9-4 victory. Nelson said, "We again played very well and the boys were in the hunt for their first league wins of the year but we fell just short in both games." Hitters for Hailey included junior Nick Brunker (3 hits) and senior Austin Hafer (4 hits), who delivered an inside-the-park homer. Friday at Burley, the Bobcats parlayed a bunch of unearned runs into an 11-1 five-inning triumph. Boyle pitched gutsy ball for Wood River but couldn't overcome the defensive lapses. Soph Gray David drilled an RBI single. Wood River (1-15, 0-9 league) will have its hands full with the Minico Spartans (9-7, 6-3) for a single game Friday, April 20 at 4:30 p.m. at Founders Field. Minico beat the league-leading Twin Falls Bruins (13-2, 8-1) by a 7-5 score last Friday at Rupert, and then dropped a 9-0 and 8-3 league doubleheader at Twin Falls on Saturday.